There are so many instances when tiles are broken while working on a project and thrown away instantly. Sometimes, when mishandling takes place at a warehouse, home or in transit, tiles are damaged beyond use. Obviously, you will be perturbed over the damage. But keep beating about the bush is not an answer to your problem. You must know that left over or broken tiles can be used to make a mosaic rather than getting these thrown away. With a little effort, your broken tiles may help decorate your walls as well as floors, pillars and lobby, etc. marvelously. So, don’t throw it away and instead preserve these to make as many as design patterns you are willing to create. The following few steps, if taken, make you aware of the fact that how a mosaic is made out of broken tiles. Fuel your imagination and get an innovative idea in your mind to make a beautiful mosaic design. Do one thing, first sketch a drawing according to your plan. This sketch would help you guide properly to prepare a design as you ever dreamt off. Collect your broken tiles into color categories. When you have all of your broken tile pieces, lay them onto the surface that you want to decorate. Cut a piece of cardboard and lay out broken tile pieces as per the sketch drawn before you go to make a mosaic tile. You can place the large piece in the middle and put around all the smaller pieces. If your pieces are bigger than you need, break them into desired or small pieces. Pieces can be square, rectangular or triangular. Now it’s time to design a mosaic. Affixed broken tiles on the surface with some glue, mastic, thinset, adhesive or cement. Create a variety of decorative mosaic tiles depending upon the type and quantity of broken tiles. Adhesives have a chemical property. So for precautionary measures, you must put on your gloves while using adhesives to joint or put the broken tile pieces tighter and sealing its grout properly. Gloves would also protect your fingers from being cut with shard or sharp edged pieces of broken tiles. Mosaic pattern for wall, floor and pillars, etc. 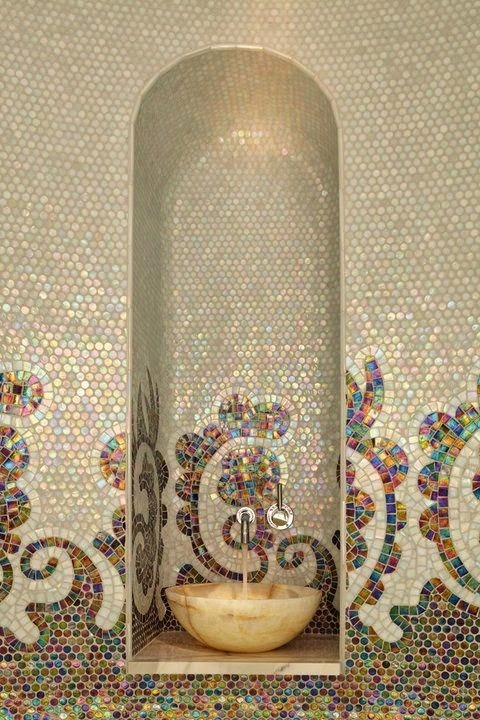 Now-a-days mosaic patterns have become a great healer or boon for your floor, wall, pillar, etc. If a tile is broken or some cracks have developed on the surface of a pillar, wall or floor tile, then you need not to go to buy a tile for getting it fixed on the place from where you have chipped off the broken or cracked tile. Do one thing, collect the broken pieces and add some colorful small pieces of tiles to make an attractive mosaic design pattern. Start laying or fixing these pieces on wall, pillar or floor exactly on the place from where you removed the broken tile pieces. Fix these pieces applying with mastic or glue or any adhesive. Once you have created an even adhesive surface for tiles, inlay these according to your design concept. Now, allow to dry the spot for at least 24 hours. If moisture prevails than you have to wait for another 1-2 days. You can use soft cloth for rubbing off the excess cement that covers the tile pieces. And you will see the damaged space turned into beautiful mosaic design spot and become the centre of main attraction for your family members, guests and loved one. Now you have a beautiful Mosaic within your sweet home. Grout is cement which can hold your tiles in place. It can be bought dry or pre-mixed. There is wide range of colored grouts available in the market. Spread the grout on top of your broken tile pieces surface to fill in all the spaces. Seal the grout properly. Allow it to dry slowly. At the conclusion of your project for making a mosaic from broken tiles, spray it with a grout sealant to maintain its all time glowing and elegancy to its perfection. Wet your sponge and softly wipe grout off of the surface. 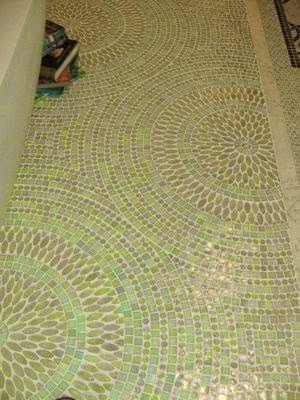 Now, we hope you will fully aware of the techniques for turning a damaged space into a beautiful mosaic design spot without having incurred a huge amount on it. Get stunning results without investment.